Bananas… I love bananas but only at certain ripeness. The skin has to be perfectly yellow with the teeniest bit of green on the top and bottom. Once the speckles appear it just doesn’t taste as good and therefore I tend to end up with bananas that are over-ripe but perfect for baking with. When Sainsburys asked me to create a banana recipe for Fairtrade Fortnight I had loads of ideas whizzing around in my head and the idea of banoffee wouldn’t go away. I didn’t want to create a banoffee pie but I love how well the toffee flavour works with bananas. 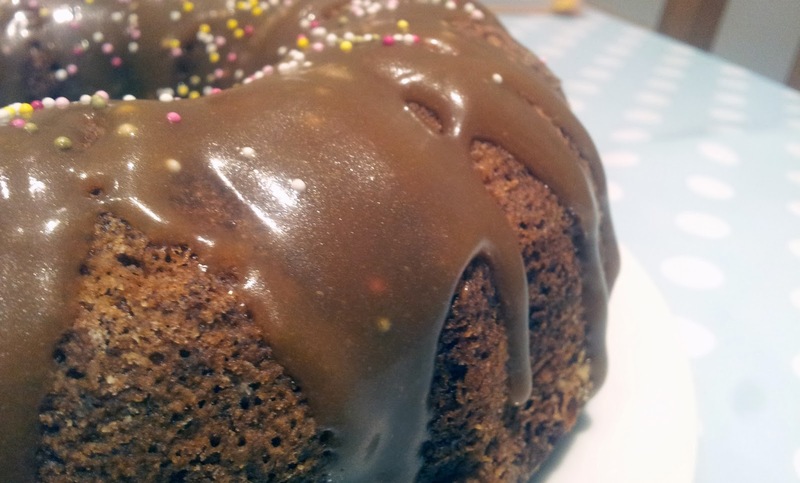 I also love banana bread but that was too easy so then I thought – Banoffee Bundt! 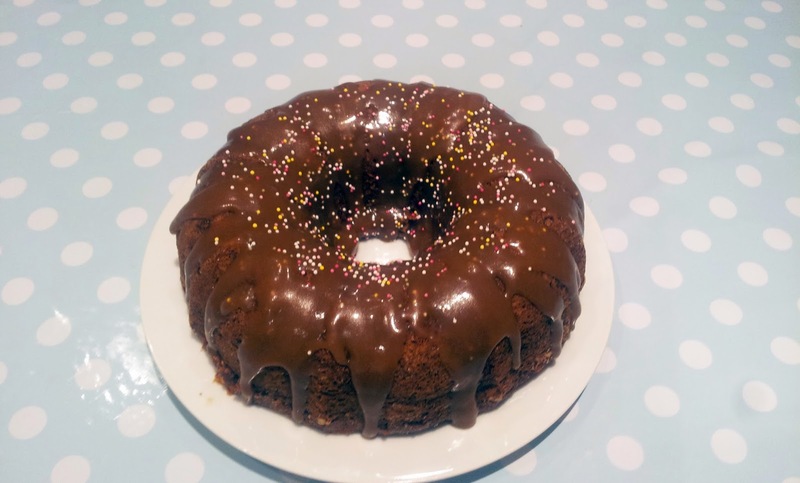 Ok my bundt tin isn’t a proper Nordicware one and it’s a cheap imitation from Home Bargains for £1.99 but it does its job until I buy a real one. 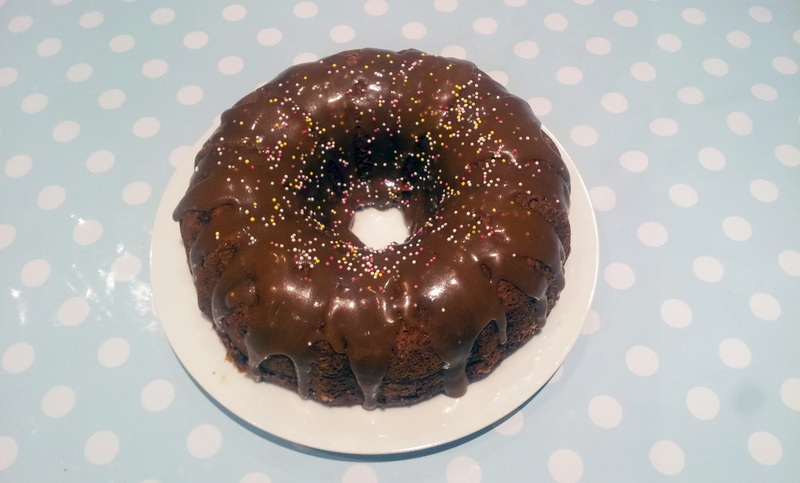 So recipe… I was flicking through my CCC Cookbook looking for inspiration on my banoffee idea when I spotted the recipe for Sticky Toffee Cake and I knew that was the base to use for this cake. 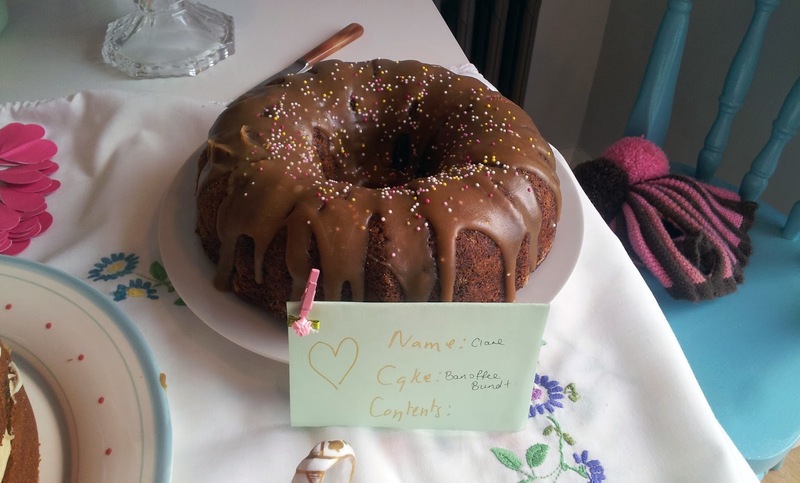 I brought it to Cake Club on Sunday and then made it again for my birthday in work on Tuesday and both times it got good reviews. Personally I think it will taste better warm but it’s pretty scrummy when cold too. I also doubled up the toffee sauce bit, you can never have too much of that stuff! Add the milk, water and dates to a saucepan and simmer on a low heat until all the liquid is absorbed (it turns a bit pulpy) and set aside. While the dates are simmering cream the sugar and butter together until pale and fluffy. Leave the date mixture to cool for about 5mins then add the bicarbonate of soda. Mash the bananas with a fork until its smooth-ish but with still a few lumps. Fold the bananas into the date mixture. Beat the eggs in a cup with the vanilla extract. Add a tablespoon of flour to the butter/sugar mix, continue to whisk then add the eggs and add the remaining flour until well combined. Fold the fruit into this mixture and place in the oven for 35-40 mins until a skewer inserted comes out clean. While the cake is in the oven make the toffee sauce. Add all the butter, cream and sugar to a pan and simmer on a low heat until the butter has melted and the sugar has dissolved. Stir occasionally until the sauce starts to thicken then set aside to cool. 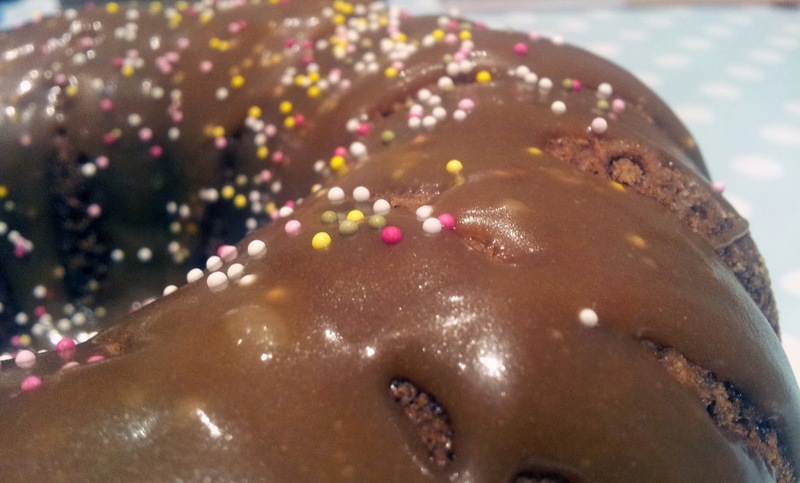 Once the cake is cool pour over the toffee sauce and set some aside to have with the cake once it has been sliced. Decorate if you wish, I couldn’t resist some sprinkles cos everything looks better with sprinkles. Now your bananas will never go to waste!